It is chilly and rainy at the moment and I have never been more tempted to spend the day nestled up in a warm blanket with a large bowl of gnocchi. Perhaps there is something about gloomy autumn weather that makes me nostalgic for Sicilian comfort food in all its richness and splendor. Although, gnocchi is eaten throughout Italy, I characterize my dish as “Sicilian” because of its Middle Eastern flavors. I have spiced up the dish by using Middle Eastern spices in the meatballs. 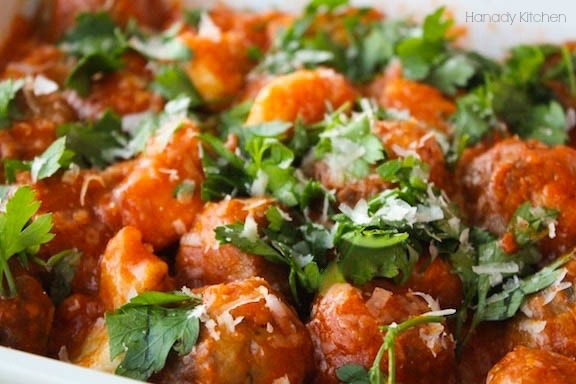 Flavored with cumin, allspice, coriander, turmeric, and cardamom, this gnocchi will be sure to keep you warm. It will also bring together two worlds to take your palate on a culinary adventure. 1) Begin by boiling the potatoes with their skins until thoroughly cooked. This should take about 40-45 minutes. Alternatively, you may bake them in the oven at 425 F (220 C) for the same amount of time. 2) While the potatoes are cooking, prepare your meatballs. Combine all of the meatball ingredients in a large bowl and mix by hand. 3) Roll meatballs into your desired size. And for additional browning, lightly roll them in flour. 4) Drizzle a generous amount of olive oil in a large and deep skillet over medium-high heat. Add the chopped garlic and onion to the skillet, and once they have browned a bit, add the meatballs. 5) Let the meatballs brown for about 5 minutes on each side until golden brown. 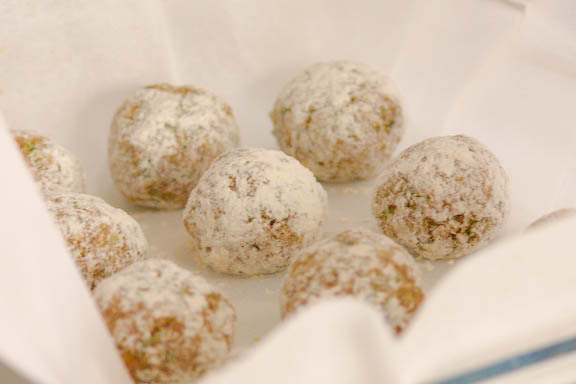 6) Add sauce, tomatoes, cream, basil, and bay leaves to the meatballs and lightly season with salt, pepper, and sugar. Cover and let cook for about 35-40 minutes on low-medium heat. 7) Once the potatoes are ready, drain them and let cool for about 10 minutes. Once the potatoes are cool enough to handle, peel their skins and pass them through a ricer. You may use a potato masher, but make sure that the potatoes are finely mashed with no visible lumps. 8) In a large bowl, add the potatoes, egg yolks, salt, pepper, parmesan, and parsley. Mix until just combined. Slowly add the flour and mix by hand until the mixture holds together. Avoid using too much flour or kneading the dough as it will harden. Instead, opt for folding the dough each time you add flour. You want your gnocchi to have a soft and pillowy texture, but it should be firm enough to support itself. 9) Cut the dough into about 6 pieces, and roll each piece out on a floured surface. Cut the pieces to form 2 cm thick gnocchi pillows. 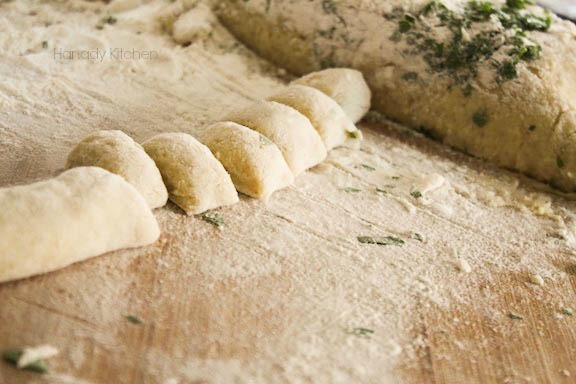 Use a fork or a gnocchi board to add ridges to the gnocchi. The ridges will allow the gnocchi to better hold the sauce. You can do this by gently pressing the gnocchi onto a fork. 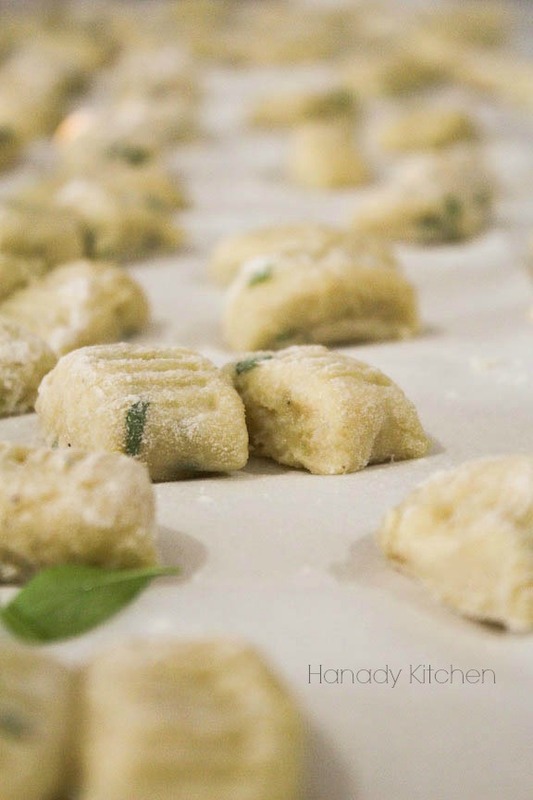 10) Place the gnocchi on parchment/baking paper until you have finished preparing the rest. 11) When ready to cook, gently drop the gnocchi into a pot of salted boiling water. Be careful not to overcrowd as they may stick together. Cook the gnocchi for about 2-3 minutes or until they float to the surface. Remove the gnocchi from the water using a skimmer. 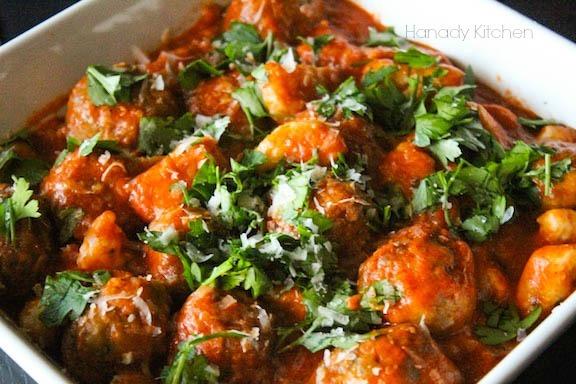 12) Drop the gnocchi into the finished sauce and meatballs. Garnish with grated parmesan, parsley, and a bit of olive oil.